We were fortunate to avoid tragedy on Alaska's Copper River, a powerful and scenic waterway in the valley of the Wrangell Mountains. I canoed it with my best wilderness travel pal, Jim. Our experiences with Grizzley Bears, homesteaders, and near disaster are documented in the Chapter "No Grizzleys" in Nothing Routine - A Quest for Discovery in Remote and Strange Places. I kayaked the sea of Cortez for a month. And I should have bought land. It was 1981. 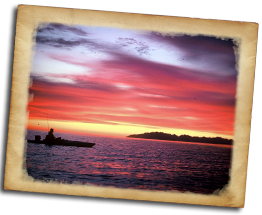 There were no paved roads, little development, and the fastest way to get to southern Baja was via boat from Mexico. During the expedition, we rose before sunrise, and paddled until noon, when the sea became rough. Then we'd make camp on a deserted beach. In the afternoon, we'd dive for our dinner. We returned with lobsters, giant sea-scallops, octopus, grouper, and even the deadly stonefish, whose meat is delectable. We never saw another kayak group. Nobody kayaked there then. It was true virgin territory.